Plain-film radiograph of a bone island. 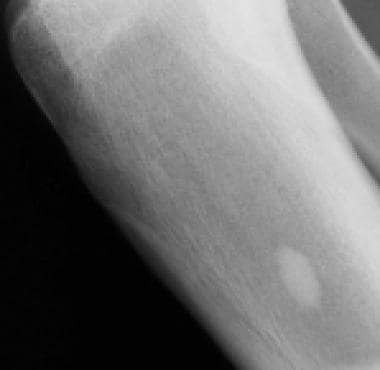 Bone islands typically appear as sclerotic, round-to-ovoid intramedullary foci. The long axis of the bone island is aligned parallel to the long axis of the bone. 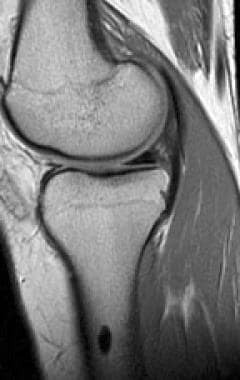 T1- weighted, sagittal magnetic resonance imaging (MRI) scan of the knee. Because bone islands are composed of cortical bone, they demonstrate low signal intensity on MRI scans. Osteopoikilosis. 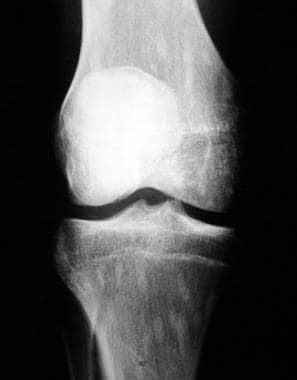 A plain film radiographic image of the knee demonstrates numerous bone islands in a peri-articular distribution that is characteristic of osteopoikilosis. The process usually does not result in symptoms or abnormal laboratory values, although associations with mild arthralgias and/or dermatologic manifestations have been reported. Osteopoikilosis is frequently associated with other bone dysplasias, and in that case, the disorder is designated “overlap syndrome.”  As with solitary bone islands, the multiple bone islands of osteopoikilosis typically are not apparent on bone scintigraphy studies and can therefore usually be distinguished from multifocal osteoblastic metastases (see the images below). [10, 11, 12, 13] Rare cases of misdiagnosis of this benign condition mimicking sclerotic bone metastasis have also been described. Osteopoikilosis. A whole body bone scan for the radiograph of the same patient as in the previous image does not demonstrate increased scintigraphic activity. Osteopoikilosis typically does not appear "hot" on bone scans. 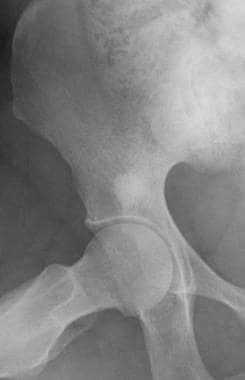 Plain film radiograph of the hip. The right iliac bone demonstrates a bone island with "thorny" radiations that merge with the surrounding trabeculae. Bone islands usually are 1 mm to 2 cm in diameter, with their size typically remaining stable. However, reports have described bone islands that have increased or decreased in size; complete disappearance has also been reported. They can be found at any osseous site, with the pelvis and long bones (especially the proximal femur) most commonly involved. Other involved sites include the ribs, the carpal and tarsal bones, and the thoracolumbar vertebral bodies. Plain film radiograph of the pelvis. A sclerotic focus that is compatible with a bone island is seen in the right iliac bone adjacent to the sacroiliac joint. Bone islands typically are 1 mm to 2 cm in diameter. Computed tomography (CT) scan. 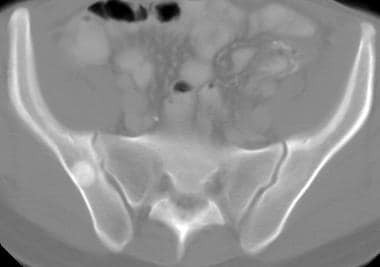 A sclerotic focus that correlates with the radiograph in the previous image is seen in the right iliac bone adjacent to the sacroiliac joint. CT scan findings of bone islands correlate with their plain film appearance. 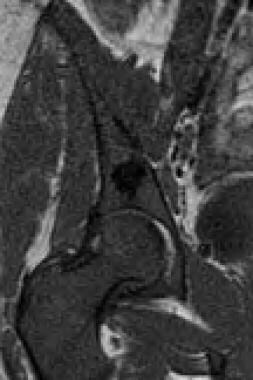 Magnetic resonance imaging (MRI) scan of the hip. A T1-weighted, coronal MRI scan demonstrates a focus of low signal intensity. The bone marrow is abnormally hypo-intense, because normal fatty bone marrow has been replaced with red marrow in this patient, who also has sickle cell disease. 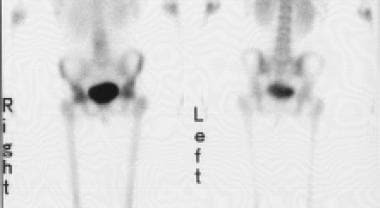 Anteroposterior and posteroanterior views from a whole body bone scan do not demonstrate a corresponding focus of increased scintigraphic activity with the radiograph shown in the previous section on Radiography. Bone islands typically do not appear "hot" on bone scans. Resnick D. Enostosis, hyperostosis, and periostitis. Bone and Joint Imaging. 2nd ed. Philadelphia, Pa: WB Saunders; 1996. 1211-4. Gould CF, Ly JQ, Lattin GE Jr, et al. 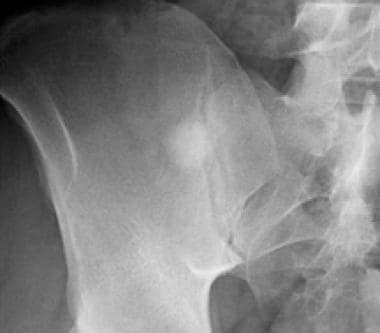 Bone tumor mimics: avoiding misdiagnosis. Curr Probl Diagn Radiol. 2007 May-Jun. 36(3):124-41. [Medline]. Niwa N, Kobayashi H, Hatakeyama N, Hasegawa S. An enostosis may be misdiagnosed as a ureteral stone. Intern Med. 2013. 52 (12):1441. [Medline]. Achong DM. 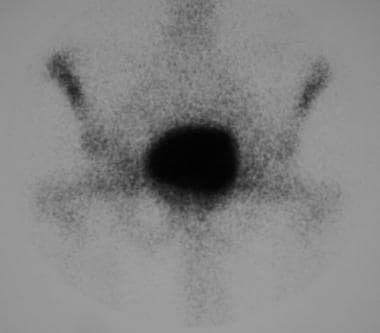 Increased uptake in a vertebral bone island seen only on SPECT. Clin Nucl Med. 2007 Aug. 32(8):620-3. [Medline]. Boulet C, Madani H, Lenchik L, Vanhoenacker F, Amalnath DS, de Mey J, et al. Sclerosing bone dysplasias: genetic, clinical and radiology update of hereditary and non-hereditary disorders. Br J Radiol. 2016 Jun. 89 (1062):20150349. [Medline]. [Full Text]. Ellanti P, Clarke B, Gray J. Osteopoikilosis. Ir J Med Sci. 2010 Dec. 179(4):615-6. [Medline]. Aghdashi MA, Aghdashi MM, Rabiepoor M. Osteopoikilosis: pain as a presenting symptom in three family members. Clin Med Insights Arthritis Musculoskelet Disord. 2011 May 2. 4:29-32. [Medline]. [Full Text]. Demir SE, Özaras N, Poyraz E, Toprak H, Güler M. Coexistence of osteopoikilosis with seronegative spondyloarthritis and spinal stenosis. J Phys Ther Sci. 2015 May. 27 (5):1625-7. [Medline]. Couto AR, Bruges-Armas J, Peach CA, et al. A novel LEMD3 mutation common to patients with osteopoikilosis with and without melorheostosis. Calcif Tissue Int. 2007 Aug. 81(2):81-4. [Medline]. Menten B, Buysse K, Zahir F, et al. Osteopoikilosis, short stature and mental retardation as key features of a new microdeletion syndrome on 12q14. J Med Genet. 2007 Apr. 44(4):264-8. [Medline]. Stark Z, Savarirayan R. Osteopetrosis. Orphanet J Rare Dis. 2009 Feb 20. 4:5. [Medline]. [Full Text]. Sari I, Simsek I, Guvenc I, Sanal HT, Erdem H, Pay S, et al. 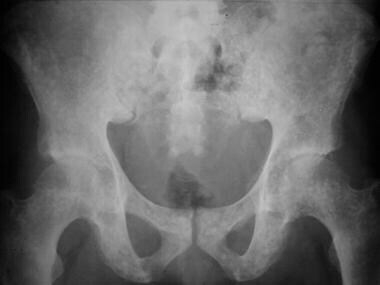 Osteopoikilosis coexistent with ankylosing spondylitis and familial Mediterranean fever. Rheumatol Int. 2009 Jan. 29(3):321-3. [Medline]. Greenspan A, Stadalnik RC. Bone island: scintigraphic findings and their clinical application. Can Assoc Radiol J. 1995 Oct. 46(5):368-79. [Medline]. Brien EW, Mirra JM, Latanza L, et al. Giant bone island of femur. Case report, literature review, and its distinction from low grade osteosarcoma. Skeletal Radiol. 1995 Oct. 24(7):546-50. [Medline]. Caballes RL, Caballes RA. Polyostotic giant enostoses with strongly positive radionuclide bone scan. Ann Diagn Pathol. 2004 Aug. 8(4):247-51. [Medline]. Greenspan A, Klein MJ. Giant bone island. Skeletal Radiol. 1996 Jan. 25(1):67-9. [Medline]. Ikeuchi M, Komatsu M, Tani T. Giant bone island of femur with femoral head necrosis: a case report. Arch Orthop Trauma Surg. 2009 Mar 21. [Medline]. Park HS, Kim JR, Lee SY, et al. Symptomatic giant (10-cm) bone island of the tibia. Skeletal Radiol. 2004 10 21. [Medline]. Dong Y, Zheng S, Machida H, Wang B, Liu A, Liu Y, et al. Differential diagnosis of osteoblastic metastases from bone islands in patients with lung cancer by single-source dual-energy CT: advantages of spectral CT imaging. Eur J Radiol. 2015 May. 84 (5):901-7. [Medline]. Ulano A, Bredella MA, Burke P, Chebib I, Simeone FJ, Huang AJ, et al. Distinguishing Untreated Osteoblastic Metastases From Enostoses Using CT Attenuation Measurements. AJR Am J Roentgenol. 2016 Aug. 207 (2):362-8. [Medline]. [Full Text]. Elangovan SM, Sebro R. Accuracy of CT Attenuation Measurement for Differentiating Treated Osteoblastic Metastases From Enostoses. AJR Am J Roentgenol. 2018 Mar. 210 (3):615-620. [Medline]. [Full Text]. Trombetti A, Noël E. Giant bone islands: a case with 31 years of follow-up. Joint Bone Spine. 2002 Jan. 69(1):81-4. [Medline]. Disclosure: Received grant/research funds from Biomet for research agreement. for: Biomet.